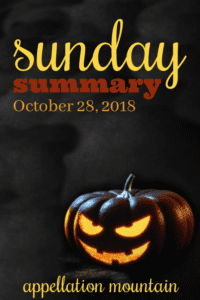 Happy Sunday … and, if you’re celebrating, Happy Halloween! The Witches’ final round is here. And the last Wizards’ showdown is here. My heart breaks for the people of Pittsburgh. I don’t normally comment on current events, but I lived in the Squirrel Hill neighborhood for a few, happy years, just blocks from the Tree of Life Synagogue. I can picture it, in every season, from the windows of city buses, passing by on foot. One of the victims of Saturday’s shooting survived the Holocaust, only to lose her life to the same hatred. Her name? Rose. I’m reminded again of how strong and resolute this name sounds, how classic, feminine, and enduring. It was my grandmother’s name, too, and I keep thinking about the tremendous power in such a simple, restrained, elegant, but open sound. I don’t know a thing about the late Rose Mallinger, but I’m carrying her name in my heart today. On a far more trivial note: these are thirteen spooky names, all given to children in real life. Meet my twins, Alucard and Morticia … erm … maybe not. Last week, British Baby Names turned the spotlight on the distinguished, but oh-so-wearable Albert. And actor Danielle Gross named her second son Jagger. Tarka, Bria, Cleo, Sally, Verena, Letitia, Yara, Sabina, Lourdes, Simone, Fatima, Larsen, Kiki, Sistine, Destry, Kit, Sailor … the group of entrepreneurs and influencers dubbed the Modern Swans by Town & Country magazine answer to some truly distinctive names. Love the names they chose for their twin daughters! And it makes me wonder: do you have a “sad-you-can’t-use-it” list? 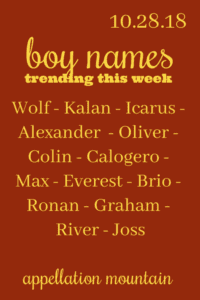 Ooh … what would you name a sibling for Avalon and Orion? I like some of Duana’s suggestions. And I so agree – kind of hoping they have a few more kiddos, because what. amazing. names! The #babynaming questions that keep us up at night. Have you wrestled with any of these? 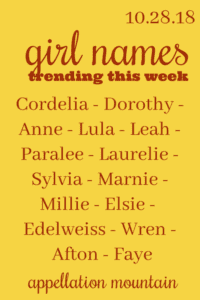 My list of girls names is much more varied, but I would be shocked if we end up with enough daughters to use them all. Some of the names on my sad-not-to-use list include Imogen, Verity, Mercy, Genevieve, and Gwenllian. ‘Eglantine, Eglantine, oh how you shine!’ Eglantine is the first name of Miss Price in ‘Bedknobs and Broomsticks.’ It never occurred to me that it was French. Technically, Chaucer used it as a given name first, so this one is English! But it’s the same word for the flower in French, so I guess they have equal claim. More here! I grew up just outside of Squirrel Hill. My oldest sister knew Rose Mallinger. I have no words to describe how awful it feels for this to have happened “at home” (though it’s been more than a decade since I lived in Pittsburgh). Oh, Kay V – hugs from one former Pittsburgher to another. Thank you for commenting.